Here at Wilson Care, Honolulu’s best option for senior living and home care, we believe that your family should be treated with the utmost care and respect. For that reason, we treat your family like our family. We value each and every resident who calls our Kalua senior living community home and we treat our home care patients like we’d treat our own elderly parents or loved ones. That’s the Wilson Care difference and you can take that promise to the bank. Our Honolulu home health care aides are different in that home health care is so much more than a job, it’s a rewarding and inspiring way to give back to the community and Oahu as a whole. When our home health care aides come into a Honolulu home, they see it as a chance to bless a family, make a friend, and give back in one of the most rewarding ways. If you’re ready to see what Wilson Homecare is all about, contact us today! In part one of our blog series, we discussed how easy it is to fall prey to misconceptions. We learned that myths and misconceptions can accompany any topic and trade and that it’s important to set the record straight in regards to all of these misguided beliefs. 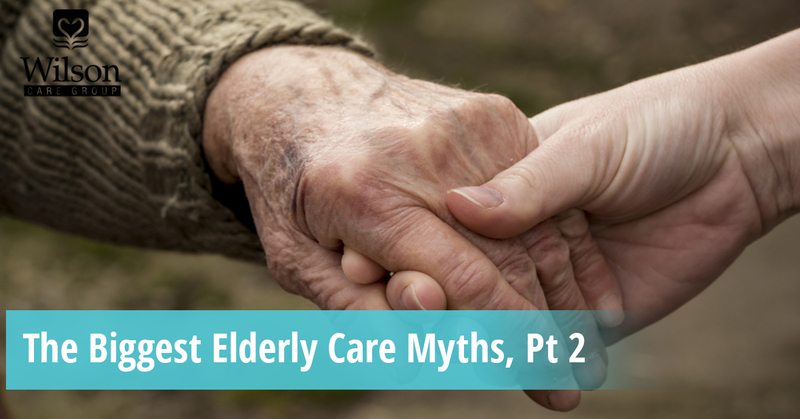 We also discussed the first two myths surrounding the world of elderly care. In today’s blog, we’re going to continue our discussion on some of the biggest myths regarding the care of elderly individuals. Continue reading to learn more and have some of your questions answered. We’d like to be the first ones to say that this myth is not only unfortunate, in our industry, it’s downright dangerous. Believing that an elderly person has no special requirements or specific care needs could mean improper care for them. At Wilson Care, all of our caregivers — whether we’re talking about home health care aides or our senior living caregivers, are highly trained in this extremely specialized and ever-changing field. People in their 80s and 90s generally have more fragile bones, slower reactions to stimuli, have specific dietary needs, have more skin sensitivities, and more. One simply cannot care for elderly folks in the same way as everyone else and Wilson Care Group understands this. Many people who have had to do some research regarding senior care have been able to find out that senior living facilities and elderly adult communities are hardly the only options when it comes to elder care here in Honolulu. Though we do stand by our Kalua senior living facility, we’d be doing the residents of Honolulu a disservice if we didn’t also mention our amazing, one-of-a-kind home health care services. For those people who want their elderly loved ones to be able to remain in the comfort of their own homes, we offer this high-quality service. A qualified home health care aide will come out to your Honolulu home as often as you need them and they’ll bear the burden of care for your elderly parent. We understand your desire to do everything on your own, especially if you come from a generation that doesn’t like to ask for too much help. We’ve found that adult sons and daughters will often take on care for their elderly parents even when they don’t have the ability to provide care on top of everything else. Think about it: you’re adding full-time or part-time care for someone on top of all of your other obligations. You’re responsible for your own job, your family’s needs, the household necessities, and so much more. Asking for elderly care help isn’t giving up or quitting, in many cases, it’s choosing to make your family, your elderly loved one, and your own sanity a priority. Don’t ever feel guilty or bad about needing to ask for help — you’ll be so thankful that you reached out. Thanks for joining us for our two-part blog series on some of the biggest elderly care myths out there. We hope that we’ve helped to set the record straight so that you’re no longer led astray by the myths and misconceptions regarding this topic. There are so many things to believe, but why not believe what’s true? To read more about elderly care in general, check out our Wilson Care blog page! If you’re ready to see what Honolulu’s Wilson Care Group is all about, contact us today. We not only provide Honolulu and Oahu as a whole with exceptional home health care options, we also have an amazing senior living facility that we’re incredibly proud of! To learn about how our services can help your family, reach out to Wilson Care. And if you’re interested in a CNA job, an RN job, or another kind of home health care aide job, check out our careers section on our website!